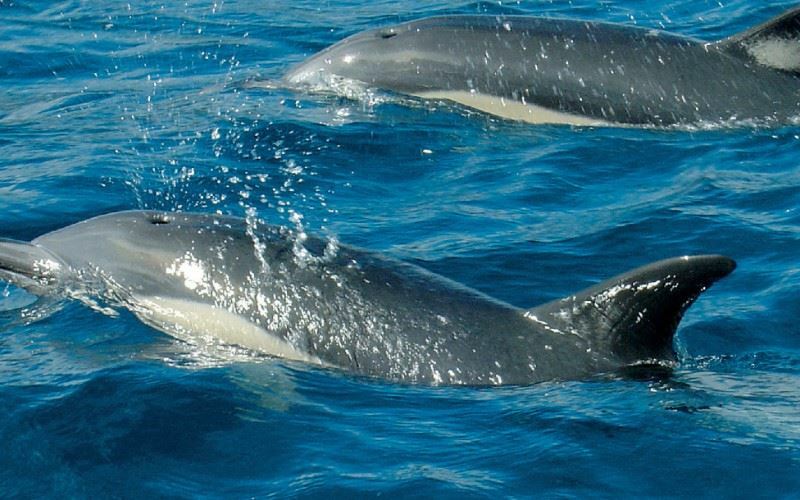 Our whale and dolphin watching holiday on Faial is based in Horta. A bustling, cosmopolitan yachting harbour, Horta is home to one of the few scrimshaw museums in the Azores. Scrimshaw, the art of engraving on whales’ teeth, was primarily born out of the boredom endured on board whaling vessels by the ships’ crew in the 19th century. The whale watching season on Faial runs from April to October, with the height of the season being July and August. Each excursion starts with a briefing by a marine biologist, introducing the cetaceans of the Azores and discussing their habitat, communication and behavioural patterns. The most frequently spotted cetaceans are Sperm whale, Short-finned pilot whale, Common dolphin, Bottlenose dolphin, Atlantic spotted dolphin and Risso’s dolphin. And, if you’re lucky, you may even get a glimpse of the False killer whale, Fin whale, Sei whale, Sowerby’s beaked whale or Blue whale, which are occasionally seen in these waters. Sao Miguel - Arrive at Ponta Delgada airport and transfer to your hotel. Overnight at the Sao Miguel Park Hotel. Transfer to Ponta Delgada airport for the flight to Faial (1-hour). On arrival, transfer to your hotel. Overnight at the Do Canal Hotel. Depart Horta harbour for a whale and dolphin watching trip (3 hours). Free afternoon - explore the town of Horta with its harbour, world famous with transatlantic sailors. Try the local speciality ‘Gin & Tonic’ at Café Sport and visit the scrimshaw museum housed above the bar. Today, we have included a full day taxi tour of the island of Pico - the second largest island in the archipelago and dominated by the steep, volcanic cone of Mount Pico - the highest mountain in Portugal. Departing from Horta Harbour, you will travel to Pico by boat (30-minutes). From here, your private taxi and English speaking driver will lead your on a sightseeing tour of the island. Your trip will include the village of Sao Roque on the north coast of Pico; the black rocks of Cachorro; Lajes do Pico - for many years, the centre of the whaling industry in the Azores; the island's Whaler’s Museum (entrance fee not included) and a stop at a ‘Verdelho’ wine cellar. Return to Faial by boat. Morning departure for a whale and dolphin watching trip (3 hours). The afternoon is free, opportunity to pre-book a private taxi tour of Faial Island visiting Caldeira, the highest point on the island at 1,043 metres, and Capelinhos, the site of the last volcanic eruption in the Azores in 1957. Free morning – why not experience the natural beauty of the blue island of Faial in a 4x4 wheel drive? Sunvil are able to pre-book a Jeep Tour of Faial which takes you on an unforgettable journey through the island’s best trails. Driving through trees and pastures overlooking the Atlantic Ocean you will discover places and landscapes of rare beauty not often encountered by the average tourist. In the afternoon, depart Horta Harbour at 14:30 for a whale and dolphin watching trip (3 hours). Sao Miguel - Transfer to Horta airport for the flight to São Miguel (1-hour). On arrival, transfer to your hotel. The Do Canal Hotel enjoys a prime location in the heart of Horta, opposite the marina and within easy walking distance of the popular 'Peter's Café'. The Do Canal Hotel enjoys a prime location in the heart of Horta, opposite the marina and within easy walking distance of the popular ‘Peter’s Café’. This four-star property provides an ideal base for those wishing to explore the town’s narrow streets, enjoy a day-trip to Pico and Sao Jorge or participate in a whale-watching excursion (Apr-Oct). Some rooms have a French balcony and ocean view.